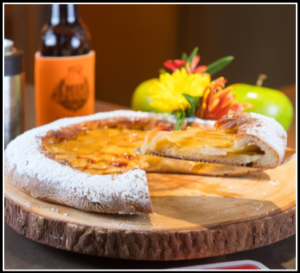 Image of Lager Crust Apple Tart taken for the Beer Institute. Recipe was created by Chef Laurent Aubel. Preheat the oven to 400 degrees F. This is a must – do not start baking until the tart until the oven has been fully preheated. In a medium bowl, dissolve yeast and in warm water. Let stand until creamy, about 10 minutes. In a separate bowl, combine flour, salt, and sugar. Slowly combine mixtures while also adding beer and mix until smooth. Let rest for 5 minutes. Turn dough out onto a lightly floured surface and roll into a 15-inch round. Transfer crust to a lightly greased tart pan. Put the apple slices on top in overlapping circles to within ½ inch of the edge. Fold the dough over the apples. Mix sugar and melted butter and brush the apples. Cook the tart for about 30 to 45 minutes or until apples are tender and crust is golden in color and cooked through. Let cool before serving.